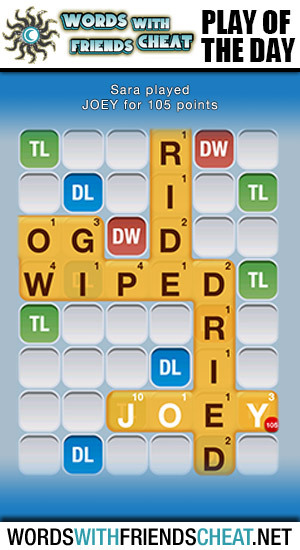 Today’s Words With Friends – Play Of The Day is JOEY (105pts) and was submitted by Words With Friends Cheat user Sara. Today’s Play Of The Day features another high scoring short word. Using only three letters, Sara earned 105 points. She did this by placing her “J” on a triple letter and finishing off the play by incorporating a triple word tile. 1. any young animal, especially a kangaroo.